Your microbiome impacts weight loss! That statement is true. And this blog post will help you understand how you can change your microbiome to increase your probability to lose fat and maintain a healthy weight. Have you tried numerous diets were you’ve lost weight, but then ended up regaining those pounds and more? If you answered “Yes” to any of these questions, or if you’ve struggled with your weight in other ways, then you need to read this post. Or watch the video that I’ve produced to help you better understand how your microbiome impacts weight loss. The answer to your weight management concerns resides in the makeup of your gut microbiome. The bacteria and other microorganisms that help you process the foods you eat. While an unhealthy diet, a sedentary lifestyle, and perhaps your genetic makeup can contribute to your battle of the bulge, more and more research is showing that this is not a human genetic issue but rather a microbiome issue. To help you better understand this let’s talk about your DNA or “genes” which are the building blocks of life. Genes carry the genetic instructions that shape and form every living thing. This diversity is huge and plays a significant role in determining your overall health and wellness. Your microbiome has a powerful influence on your food choices. Many times, the foods you crave, have very little to do with want you want. Rather it’s your microbiome that’s influencing your food choices. They want the food that will make them happy, not you. And when you compare the influence of 3.3 million microbial genes to your 22,000 human genes you can see who has the bigger influence. How to we know this to be true? The most famous study in this area is the one done on identical human twins. Each twin has the same genetic makeup. However one twin was overweight and the other twin was lean. The researchers then took their human microbiome and injected it into the gut flora of mice so that the microbiome of the mice took on the nature of the human twin. Each recipient mice was given the same diet and daily activities. The results were that the mice with the microbiome from the lean human twin stayed lean. 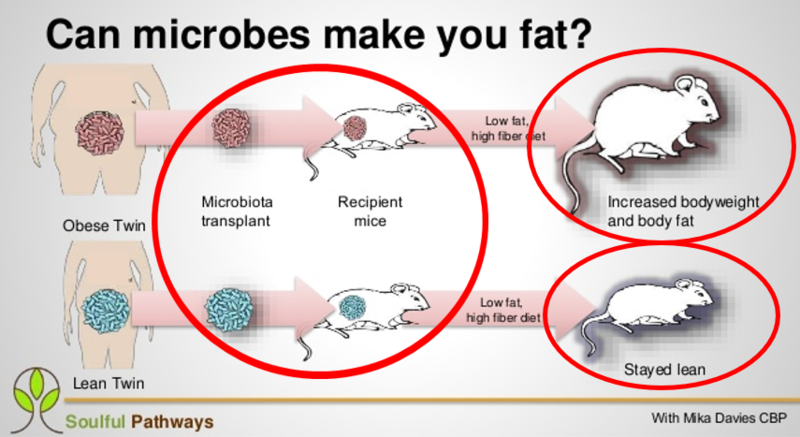 And, the mice with the mircobiome from the overweight human twin gained weight and stored fat. What was even more interesting was the makeup of the microbial communities between the two twins. For the overweight twins, their microbial community was dominated by Firmicutes. Whereas, the microbial community of the lean twins were dominated by Bacteroidetes. Most studies now show that the higher your bacteroidetes compared to your firmicutes, the leaner you will be. Unfortunately, there are several common triggers that increase firmicutes over bacterioidetes, which then contributes to fat storage and weight gain. Trigger 1 – High intake of omega-6 fatty acids from vegetable oils. Most processed foods use some form of vegetable oil for shelf stability. The problem is these types of omega-6 oils trigger inflammation, which favors the Firmicutes. Trigger 3 – Sugar and processed carbohydrates, like modern-day wheat, are fuel for Firmicutes, which again allows them to dominate your abdominal microbiome. This explains why some people have an extremely hard time losing weight. What was once thought to be a slow metabolism, or poor human genes, is no longer the case. Instead, their microbial community, and how it processes food, plays a greater role. If you change the gut, then you can change the outcome. This is your key if your goal is fat loss and weight management. While the food industry, and our government, have tried to convince us that these omega-6 vegetable oils are safe and heart-healthy, they are not. These oils are inflammatory, and help create an environment that allow Firmicutes to flourish, which then creates toxins that your body has to address. The easiest way for your body to remove these toxins from your system is to store them in fat cells. And the more toxins your gut microbiome produces, the more fat cells your body needs to store them. 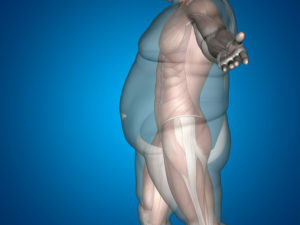 The result is weight gain through larger and more fat cells. When used in weight management studies, these healthy, anti-inflammatory omega 3 fats create an environment where healthy gut flora can dominate. This lowers inflammation levels, produces significantly less toxins, and increases the probability of weight loss. Step #3 – Eliminate Wheat from your diet. This will be your hardest step because wheat is foundational to most processed foods. So why are we targeting wheat. Because modern-day wheat has been genetically engineered so that it now has a higher glycemic index than table sugar. It’s fuel for firmicutes and a toxin producer. When you add all this up, it significantly increases your potential for weight gain as well as other metabolic disorders. The book Wheat Belly by Dr. William Davis is an excellent resource to help you understand how damaging modern-day wheat is to your health. Most of the foods you eat come packaged. With a section on the label for Nutrition Facts. 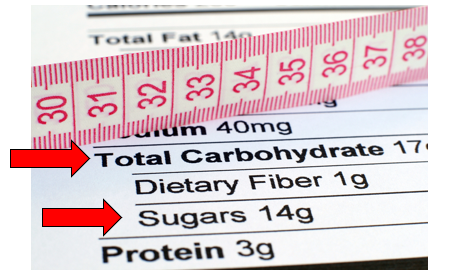 Find it and locate the line that says “Total Carbohydrate.” Under this you will see a line that says “Total Sugars.” This is the line that you want to pay attention to. 1 teaspoon of sugar is equal to 4 grams. This means that if you divided the number of grams of sugar by 4 you will determine the number of teaspoons of sugar per serving. Ideally you only want to consume foods that are less than 1 teaspoon or 4 grams of sugar per serving. Initially, this might by hard because your existing microbiome loves sugar as its food source. And when you’re not supplying them with sugar, then they create cravings for highly processed and sugar laden foods. As you added vegetables and plant-based foods to your diet, like Pea Protein Powder, you’ll find this step easier and easier to do. Change Your Gut To Change The Outcome! Now if you’re interested, I use a program called The Purify Kit to help my clients reset their gut health in 7 days. This is a clinically proven program that has help my clients quickly and effective improve their energy, get control over their cravings, and begin the process of getting fat off their body. If you have any questions about the material I shared with you, then please either email me at dan@agingnomore.com or call me directly at 630-936-8079. I’m part of The Million Lives Project and our goal is to help a million people or more understand how they can naturally reset their gut health to significantly improve their overall health and wellness. Become a part of our Million Lives Project by sharing this post with others.